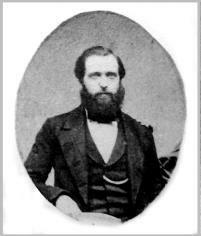 As every member of the Regiment knows, the first soldier of The Queen’s Own Rifles of Canada to fall in combat was newly commissioned Ensign Malcolm McEachren of No. 5 Company. He was taking part in the Battle of Ridgeway on 2 June 1866 and died shortly after being mortally wounded in the abdomen by the American Fenian invaders. 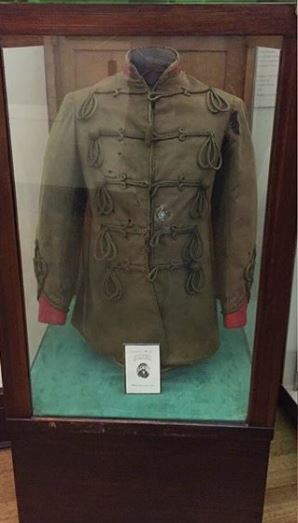 One hundred years after that battle, the tunic he wore that fateful day was presented to The Queen’s Own Rifles by Old Fort Erie of the Niagara Parks Commission having been handed down by McEachren’s daughter. After 152 years, it has obviously suffered its share of insect and light damage although without any condition reports surviving, its impossible to know when this damage occurred. We do know that it has faded from rifle green to almost olive drab – although not under the arms or at the back – and the light damage has also made the material brittle. And museum staff have often joked that the exhibit case it was stored in, was old enough to qualify as an artifact itself! We can’t reverse the deterioration that’s taken place, but my goal from day 1 of becoming Curator in 2012, has been to find a way to preserve THE most valuable object in our collection for the future. And now after 6 years it has finally become a reality! Thanks to a very generous bequest from the estate of the late Chief Warrant Officer Scott Patterson, we were finally able to place an order with Zone Display Cases for a custom-made museum quality case with frameless UV filtering glass, Abloy security locks, and an airtight exhibit compartment with desiccant tray to ensure a constant humidity level. 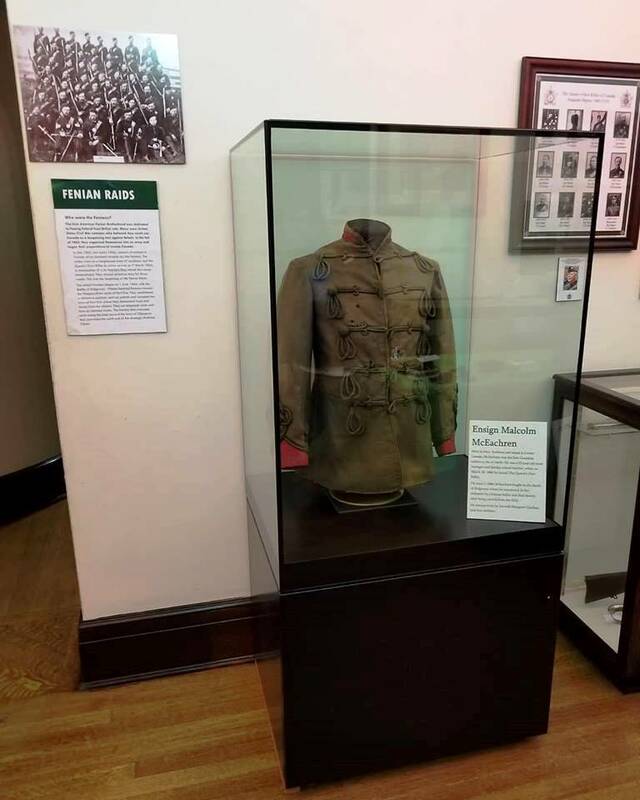 This week it arrived at the museum and last night our museum team set up the new case and moved the tunic into its new home which we hope will help to preserve this extremely important object for many years to come. In the new year, we will be redesigning the complete Battle of Ridgeway exhibit and of course this tunic and its new case will continue to have pride of place. The Patterson bequest covered about 75% of the costs for this project and we are still hoping to raise the remainder before the end of our 2018 fiscal year. Thank you to all those who have contributed to date, and to those who would still like to help, you can make a donation online to the QOR Trust fund via CanadaHelps.